The most often found species of Hydnophora are Rigida and Exesa,these can be easily confused with each other when they are small but as the coral grows the longer branches of the Rigida become apparent over the encrusting\plating growth of the Exesa.Both corals are most often seen in a neon green or some times a yellow green,there are pinkish specimens that are harder to come by. 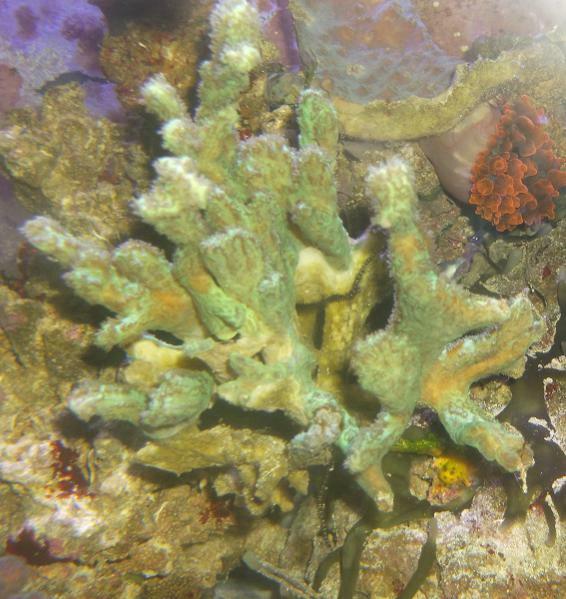 Lighting can be high for this SPS coral but unlike many SPS the Hydnophora can be kept in the lower moderate lighting if kept higher in the water column.The flow should be moderate but not too great or it will not expand it's bright neon green polyps. A mainly photosynthetic coral that derives much of its sustenance form lighting Hydnophora can also eat smaller frozen and live foods suitable for corals such as baby brine and mysis shrimp. Hydnophoras are extremely aggressive corals with a potent sting that can eradicate close by corals so it is a good idea to give this SPS a few inches from its neighbors. To propagate this SPS a small fragment or branch can be cut or snapped off and attached to another type of substrate such as coral rubble. Soon it will begin to encrust and expand its skeleton structure. Last edited by badxgillen; 05-14-2014 at 11:48 PM.